Thinking Pinoy: Comelec and DOTC Corruption: Wife's exposé breeds another exposé? Comelec and DOTC Corruption: Wife's exposé breeds another exposé? Patricia “Tisha” Bautista, wife of COMELEC chair Andres “Andy” Bautista, executed a sworn affidavit accusing the husband of so many things, I don’t even know where to start. To make the explanation simpler, let me list down the basic allegations one by one [CNN]. That Andy amassed hundreds of millions of pesos’ worth of bank deposits in 38 accounts, most of which are undeclared in his SALN. That Andy has real estate, some of which are undeclared in his SALN. That Andy engaged in influence peddling within the Comelec in exchange for commissions from Andy’s supposed beneficiary, the Divina Law Firm. To back her accusations, Tisha provided Andy’ passbooks and other financial documents. "The substantial deposits and withdrawals in each of the accounts were made within the last two years, and coincidentally, while Andy was already the COMELEC Chairman and when the 2016 National and Local Elections were conducted,” Patricia said in the affidavit. Yeah, by the looks of it, Andy is dead meat. But before I expound on the allegations, I think that, as a side story, I should discuss the issue of admissibility of evidence, and thanks to MyLegalWhiz for the legal resources. That is, should Andy be tried for, say, graft, he can petition the courts to declare Tisha’s evidence and testimony inadmissible, as Tisha is still married to Andy and spousal privilege applies. However, the defense can argue that the existence of such a level of strain is still under debate. Tisha has been wanting to be legally separated from Any in as early as 2013, but the fact remains that both still live under one roof. Yes, there’s a pretty good chance that the documents Tisha provided are inadmissible in court, should a graft charge be filed against Andy. Tisha can testify against Andy and submit the financial documents if the case is Tisha vs Andy, and that’s where the last part of Tisha’s affidavit comes in. On page nine of her affidavit, Tisha accused Andy of abandoning his financial responsibilities to family, which prompted Tisha to “file a case of Violence Against Women and Children (VAWC)… in Taguig City… against Andy for the emotional and economic sabotage… that he is performing against [Tisha] and [her] family”. That is, Tisha can present the evidence shown in yesterday’s press conference as proof of Andy’s financial capability, and she can also testify against Andy if the need arises. After all, the VAWC case is Tisha vs Andy, which qualifies as an exception to the Rule on Spousal Privilege. Now, you may ask: how can this VAWC case be relevant to crimes Andy supposedly committed in the Comelec? Well, testimonies and evidence provided in court proceedings become public record after cross-examination. That is, government prosecutors for a prospective graft case vs Andy may use whatever Tisha will say and show during the VAWC hearings.In short, the passbooks, financial records, and testimonies, if introduced in this manner, will be perfectly admissible as evidence in court. Yeah, Andy is toast if the documents turn out to be authentic. Now that we got the admissibility issue out of the way, there’s something else, something more important, that I have to let you know. Andy’s controversial bank accounts are mostly with a certain “Luzon Development Bank (LDB)”, with the 35 LDB passbooks’s deposits totaling P329 million, or about twice as much as the Andy’s net worth in his latest SALN [GMA]. First, so many bank accounts for just one person? Second, a deliberate attempt to evade AMLC’s radar? Tisha also noted in the affidavit that the deposits to the accounts are hefty, but are less than P500,000 each. Only deposits worth P500,000 are automatically reported to the Anti-Money Laundering Council [GMA]. Yes, the numerous deposits evaded AMLC’s radar. Third, why so much money in such a small bank? LDB is a pretty small bank, holding only P4 billion, P3 billion, and P2 billion in deposits as of 2014, 2013, and 2012, respectively [LDB]. Thus, depositing P329 million – a large amount in relation to the bank’s size – seems to be an unnecessarily risky bet. After all, there are lots of other bigger banks that are better equipped at handling such an amount. Prospective money launderers find it advantageous to keep money in smaller banks because these are not usually subjected to the same stringent standards that the AMLC imposes on big banks like BDO, UnionBank, and BPI. And here’s where it gets more interesting. Yes, Andres Bautista is a world class finance lawyer, and with his over two decades of world class experience, he knows the ins and outs of money laundering like the back of his hand. Now, add the fact that the LDB accounts have already raised three red flags. That is, if I will choose someone who will launder my money, I’d probably choose Andres Bautista. There are many small banks, so why did Andy specifically choose LDB? 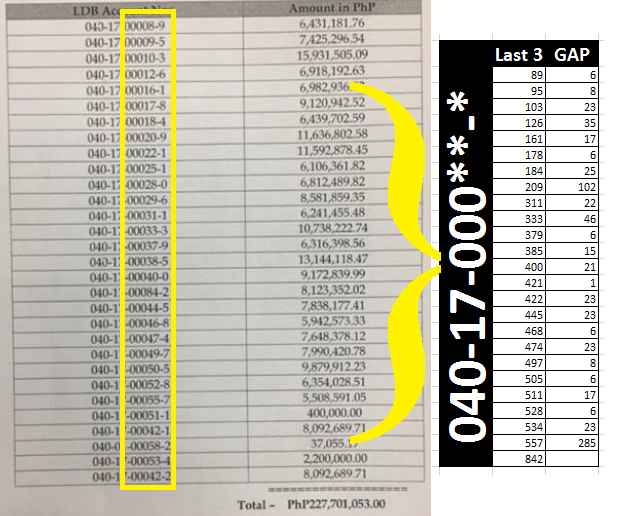 There aren’t a lot of big-ticket election cases filed in the Comelec, so how can Andy’s passbooks contain such an astronomical amount? LDB’s ownership provides a clue. What is Luzon Development Bank? Laguna-based community bank LDB was founded in 1961 by the Limcaoco Family [LDB] and it has about 40 branches today. Yes, it’s larger than a rural bank, but a lot smaller than the major banks that most of us are familiar with. LDB is a subsidiary of the Lica Group [Lica], also controlled by the Limcaoco Family, with Rene “Timmy” Limcaoco as one of its managing directors [Old Swiss Inn]. It’s the same Timmy Limcaoco who was Aquino’s DOTC Undersecretary of Planning and Infrastructure Projects. Limcaoco was appointed DOTC Usec in 2011 upon the recommendation of then DoTC Secretary Mar Roxas. Describing Limcaoco as a successful businessman, Roxas tasked him to handle DoTC’s Public-Private Partnership (PPP) and greenfield projects sector [Inq]. Greenfield projects mean projects that start from scratch. Meanwhile, we all know what PPP’s are, and we all know that the Aquino government’s analysis paralysis made PPP’s almost impossible. Abaya retained Limcaoco when he took over DOTC, and that says something about how influential this Limcaoco is. But here’s the fun part: Limcaoco was embroiled in so many controversies during his term in DOTC. Let’s list some of them. 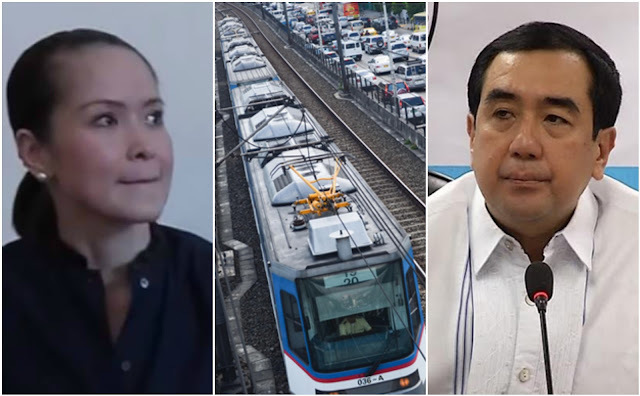 In October 2013, Czech train supplier Inekon CEO Josef Husek mentioned Timmy Limcaoco’s name in his affidavit accusing the DOTC of extorting US$30 million from his company in exchange for winning an MRT supply contract. “On 9 July 2012, upon our arrival in Manila, Czech Ambassador Josef Rychtar presented the business schedule. It included meetings with DOTC Usec Rene Limcaoco and MRT general manager Al Vitangcol the following day,” Husek said [Star]. Remember when Aquino promised that he, along with DOTC Sec. Abaya, would have themselves run over by a train if the LRT-1 extension is not completed? Well, Limcaoco handled that non-project [Star]. As it turns out, Timmy Limcaoco is a sibling of a senior Ayala Corporation executive, and Ayala is the LONE BIDDER in the project [ABS]. The Dalian trains that Abaya’s DOTC procured in 2013 turned out to be unusable for so many reasons, and I won’t expound on that anymore. What’s important in this article, however, is the confirmation that Dalian agreed to give a 5 percent kickback to Abaya and other DOTC officials for approving the contract. The DOTC bids and awards committee – of which Limcaoco is part – disqualified Dalian’s rival over a minor technicality, then awarded the P3.75-billion to Dalian. That translates to around P187 million in kickbacks [Star]. Now, you probably ask, so what does Andy Bautista have to do with all these? Andy has too much money. Andy has too many bank accounts. Timmy is part of Abaya’s corrupt DOTC. Now, how do we connect Andy and Timmy ? In a press conference, Bautista said he keeps so much money in LDB because he knows the owners and trusts them. What Andy didn’t mention, however, is how well he knows the Limcaocos. Manila Standard columnist Jojo Robles explained the link very well. In his column yesterday, Robles explained that Andy and Timmy are bosom buddies in the Ateneo de Manila High School section 4-A. Meanwhile, Andy’s brother was classmates with Timmy’s brother TG Limcaoco. Yeah, Andy and Timmy are childhood friends. Even their respective brothers are also childhood friends. So yes, there must be considerable level trust between Andy and Timmy. After all, they REALLY know each other. On one hand, we have a Timmy who may be handling tens (or even hundreds) of millions worth of dirty money from DOTC-era kickbacks and needs someone to successfully launder his money. On the other, we have a friend of Timmy’s who happens to be a world class financial lawyer, and who supposedly also needs a bank where he can launder money of his own. First, when Andy Bautista said that not all of the money in those 35 passbooks are his, did he mean they belong to Timmy Limcaoco, who may have gotten it from the Aquino-era DOTC kickbacks? Second, is it possible that, in exchange for laundering Timmy ’s dirty money, Andy will be allowed to launder his dirty Comelec money in Timmy’s own bank? Third, Tisha discovered 35 passbooks, so is Andres hiding more money in other bank accounts that Tisha (or the public) has yet to discover? Fourth, is Limcaoco’s “money” purely composed of “his”, or was he tasked with laundering the share of other DOTC officials like Roxas, Abaya, and Vitangcol? Fifth, Roxas’ family – the Aranetas – own shares in major banks, but laundering money in big banks is tough, so is it possible that the Aquino-era DOTC officials entrusted the laundering of their share of the loot to Limcaoco, who owns the smaller bank? And most importantly, did Tisha unwittingly discover part of Roxas’ 2016 election war chest? Ah, this is just too juicy! Some may be inclined to dismiss the previous questions as too speculative. But Central Bank data supports them. Earlier today, I noticed that the Andy’s LDB bank accounts are almost numbered consecutively, suggesting that LDB doesn’t have a lot of depositors. 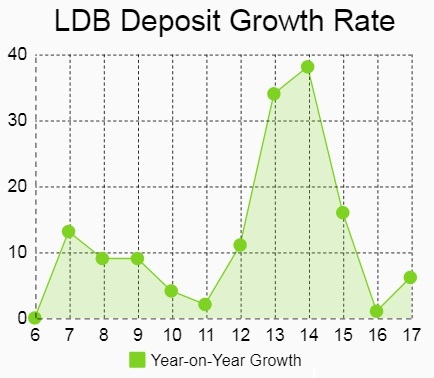 Despite this, LDB experienced massive growth in deposits. Here is a table showing LDB’s deposit liabilities, according to Bangko Sentral ng Pilipinas’ database of Balance Sheets/Statements of Condition for Thrift Banks [BSP]. 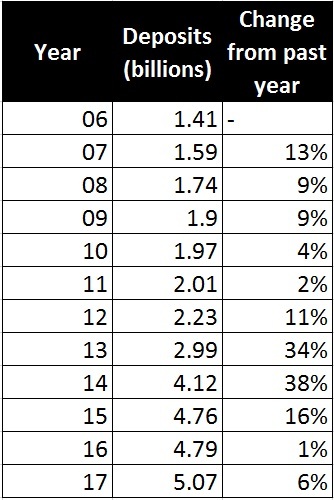 I also included a third column, which shows year-on-year growth of deposit liabilities. Sources: LDB Docs from 2006, 2007, 2008, 2009, 2010, 2011, 2012, 2013, 2014, 2015, 2016, 2017. With these, we can see that the growth of LBD’s deposit liabilities was slowing down from 2006 to 2011, then it picked up and massively accelerated from 2011 to 2014, then decelerated again from 2014 to 2017. By the way, 2015-2016 was the Election Season, remember? Hehehe. 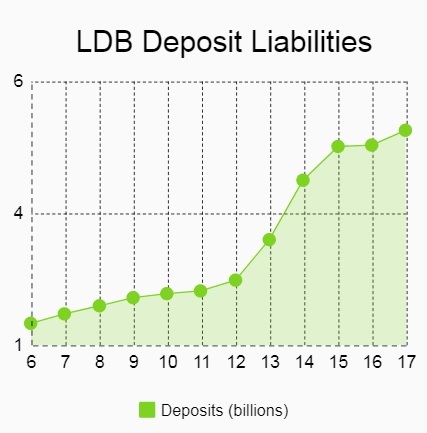 The rapid growth of deposits 2012 to 2014 boosted LDB’s deposit liabilities from just P1.9 billion in 2010 to P4.79 billion in 2016, or by about 152%. LDB appears to not be enjoying drastic growth in the number of depositors, yet it enjoyed massive growth in the total amount of deposits. Moreover, most of the growth happened from 2012 to 2014. Now, the scandals involving Timmy Limcaoco and the DOTC happened in 2013 and 2014. Did Andy team up with Timmy and Abaya’s DOTC on a joint laundry business? Did you like this post? Help TP stay up!